“We asked 100 solvers whether they thought last week’s endgame from MynoT was fair or unfair. And our survey said …” Well, who am I to say, especially since it must be so subjective (and I’m not the producer of Family Fortunes or, for those of you Stateside, Family Feud — so much more confrontational!). I suppose that, since I at least got the colouring-in bit right, I would probably err (just) on the side of fair. If I hadn’t seen the Swiss flag, would I feel any less aggrieved if I knew that 116* other solvers had also failed? Absolutely not. So on with Navajo’s puzzle in the hope that it would be somewhat less controversial. Nothing to do then but crack on, and I was pleasantly surprised when my fisrt pass through the clues produced an avalanche of answers. 10ac ERNES, 14 GALERE, 15 ACHED, 16 HIT FOR SIX, 18 TAPES and 23 TOOTHACHE, and the top half of the grid was almost complete. What’s more, 16ac required that its 9-letter answer had to be crammed into 7 squares, and these discrepancies must be figured out by the solver. No need to guess too much that it must be entered as HIT FOR 6, although the 6 is in an unchecked square. A few more acrosses to finish off, and I got 30 PLANETOID, 38 POSTAL and 42 AUTOS — a bit pathetic for the bottom half really! With so much of the grid already completed, you’d have thought that pretty much all the downs could be slotted in during my first pass through them. Sadly no, but a fair number: 3 NEAFE (nice clue: Make a fist of instant drink when there is no self-catering), 7 INHERITOR, 10 ECHT, 19 POETASTER, and half a dozen four letter words to boot. Even so, it didn’t take too long to finish the grid: probably 90 minutes. I have to say that I thought the clues were very good, although obviously a bit on the easy side. The surface readings were excellent as well; as well as Nescafé above, there was 40 Answer her at start in competition; she’ll scream at the end [BANSHEE], almost written for Wife Swap (not that I watch it, oh no). And so on to finding the directive hidden in order to get it in the post by the end of the day, which happened to be the first Tuesday after publication. As I’ve said before, I tend not to start Listeners over the first weekend, unless it is by a setter who will probably deserve a lot of head-scratching. The list of setters in this category is growing alarmingly quickly! 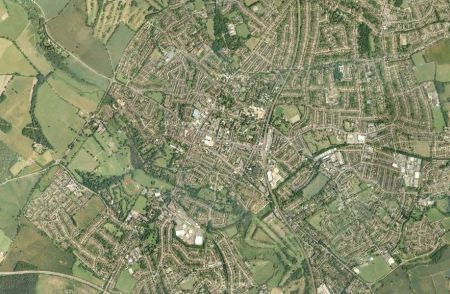 Letting my eyes wander aimlessly over the grid, it was only a few minutes before I saw ST ALBANS in row 10, and with HERTFORDSHIRE in the bottom row, and 63 GREEN LANE in the centre, we have the address that our entries are sent to every week. And a relief to be able to get a green pencil out of the case for highlighting. So, as hoped, a puzzle very much on the easy side. Except that I had managed to get away without solving most of the preamble! I had not identified the four clues which had to be preceded by the title; hadn’t identified what gave them something in common; nor found the nominal connection with the directive. The word ‘directive’ itself worried me, after all an address on its own is hardly that, being defined by Chambers as an instruction (or law). I’ve said it before, and I’ll say it again: it is imperative in a Listener to fully understand every clue and all aspects of the preamble, otherwise you run the risk of missing an important piece of the jigsaw. So, for me, the hunt was on to do just that. First of all I had to find the four clues which could be preceded by the title of the puzzle (and an article). 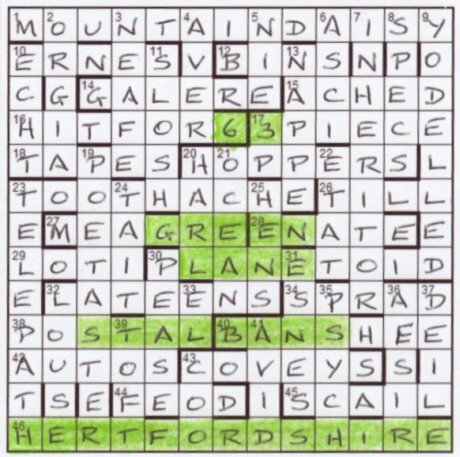 The title of the puzzle was “To …”, and looking at the sidebar where the regular weekly instructions on submitting an entry are found it says “Write your name and contact details in the space provided and send to: Listener Crossword …”. Perhaps Listener was hidden in the grid somewhere. ERNES + LIT is LISTENER, LATEENS + IR is A LISTENER, as is AESIR + LENT! Or perhaps the ‘nominal connection’ was John Green, although he is not used in the weekly address details, but so what. So I tried names. You’d think that would be futile, wouldn’t you? Well there was ERNES(T), (JOHN)NIE, (C)HARL(ES), (D)AVID, and even (GE)ORGIA! And my BRIAN was beginning to RUTH! I even examined the post code, AL3 6HE, and do you know that, if DEIL is changed to DEAL, there were 3 occurrences of AL and six of HE in the grid. But DEIL was definitely right, and those of you out there who can’t believe that I still hadn’t seen the connection, I apologise. I must confess to having heard of the Louse poem, but not the others. And why Burns suddenly got hung up with toothache we’ll probably never know, and why I got hung up on trying to understand the preamble is also a mystery. I’m still slightly unhappy with the use of the word ‘directive’, but no doubt the printed solution will make all clear, it usually does. For a debut puzzle this was a good effort (sorry to sound like a schoolmaster): a nice theme, very good clues, but how many of you realised that it wasn’t a 100% symmetrical grid?! * A number plucked from the ether. ** I’m obviously not an expert on Burns (or even Wordsworth), Kathryn! This entry was posted on 11 February 2011 at 5:00 pm	and is filed under Solving Blogs. You can follow any responses to this entry through the RSS 2.0 feed. You can leave a response, or trackback from your own site. Having done that, I glanced back at the preamble, which mentioned only ‘To A/The…’ and therefore identified ‘address’ as the supernumerary element. Which in turn meant that when I looked at the asymmetry and saw GREEN I didn’t register! Yet the asymmetry and the use of 1a did suggest Navajo was thinking about dropping additional hints to the solver. So, reasonable theme, nice clues, compromised execution/preamble, and ultimately not a pleasant solve.